Hangars seen in picture, reportedly housing missiles, similar to building at site identified as Revolutionary Guards base and allegedly struck by Israel last year. Satellite images of an area near Damascus appear to show an Iranian military base which could house missiles capable of hitting Israel, according to a report early Wednesday. 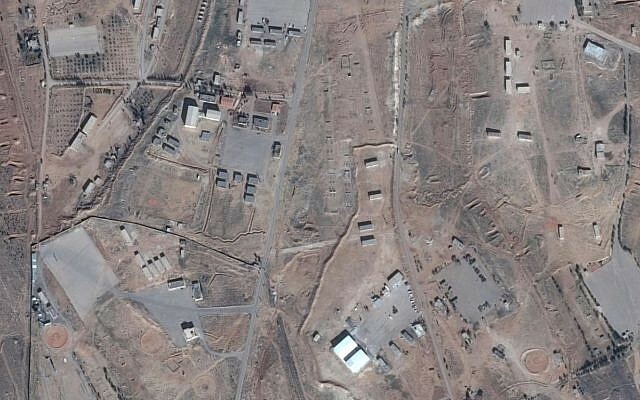 A picture of the reported base, in an area known as Jabal al-Sharqi some eight kilometers (5 miles) northwest of the Syrian capital, shows two recently constructed buildings which are similar to those seen at another base in Syria thought to have been used as a base for Iranian Revolutionary Guards Corps troops, according to Fox News, citing information from Israel-based geospatial analysis outfit ImageSat. “Don’t take every report in the media, even from a respected outlet like Fox, as an absolute thing,” the defense minister said. “We have the full picture of what’s going,” he added. The buildings were identified in the report as possible hangars housing short- and medium-range missiles. Their shape and size, 30 meters by 20 meters, is identical to a building at a site also identified as an Iranian base, reportedly targeted by an Israeli strike in December. However, an ImageSat report on that site, at al-Kiswah some 13 kilometers (8 miles) south of the Syrian capital of Damascus, identified that building in November, before it was struck, not as a missile silo but rather as a probable mosque or dining room. A BBC report on the same base also indicated analysts did not believe it was designed for storing missiles or other large arms, but rather for housing soldiers and vehicles. On Wednesday, though, ImageSat revised its understanding of the al-Kiswah building targeted in December, identifying it too as a possible missile silo. No reason was provided for the altered assessment. An earthen berm is also visible around the Jabal al-Sharqi site, indicating a likely military use. Israel has been warning for years that Iran is seeking to entrench itself militarily in Syria, including establishing missile bases. According to Israeli political and military assessments, Tehran, which has shored up Syrian President Bashar Assad in the Syrian civil war, has been working to create air and naval bases in Syria, from which it can arm the Lebanon-based terror organization Hezbollah and other Shiite groups, as well as carry out attacks of its own against the Jewish state. A report earlier this month alleged that Iran is operating 10 military bases in Syria and is training militias loyal to Assad’s regime for a possible battle with Israel, with two key facilities located near the Golan Heights border. On Tuesday, the head of US Central Command Joseph Votel warned Iran was increasing the quality and quantity of missiles it was supplying to groups in Syria and Lebanon. “Iran is generating instability across the region, and the Iranian Threat Network continues to increase in strength, enhancing its capacity to threaten US and partner nation interests,” he said. Returning from a trip to Israel Tuesday, South Carolina Senator Lindsey Graham told reporters that Iran was “testing” US President Donald Trump in Syria and in Lebanon, where Israeli officials fear Iran is helping the terror group Hezbollah build precision-guided rockets for us against the Jewish State. Graham also predicted there would soon be war in southern Lebanon, over the missiles. “They’ve told us in no uncertain terms that if this threat continues — they keep making rockets that can hit the airport and do a lot of damage to the state of Israel — they are going to have to go in,” Graham said. Iran displayed a nuclear-capable ballistic missile during parades celebrating the country’s 1979 revolution over the weekend, reinforcing concerns that it is in violation of the United Nations Security Council Resolution implementing the nuclear deal, the Washington Free Beacon reported Monday. The Ghadr (or Qadr) missile, according to Iranian military officials “can be launched from mobile platforms or silos in different positions and can escape missile defense shields due to their radar-evading capability,” according to accounts appearing in Iran’s state-controlled media. Israel is within the range of the missile when launched from Iranian territory. Taleblu also told the Washington Free Beacon, “The Ghadr can strike Israel when fired from Iranian territory, and in March 2016, was flight-tested while bearing genocidal slogans against the state of Israel.” He was referring to a test launch of a missile that had the phrase “Israel must be wiped off the Earth,” written on it in Hebrew. France and Germany joined the United States and the United Kingdom in August 2017 in sending a letter to UN Secretary General António Guterres, charging that Iran’s launch of a satellite violated resolution 2231. President Donald Trump, in October 2017, said that he would not certify Iran’s compliance with the nuclear deal and demanded that four aspects of the deal be fixed or he would no longer waive the sanctions that were lifted as part of the accord. Trump has demanded that: new negotiations eliminate the sunset provisions of the deal that allow Iran to develop an industrial scale uranium enrichment program by the deal’s end, prohibit Iran from developing ballistic missiles, ensure “anytime, anywhere” inspections so that Iran will have to allow inspectors into its military sites, and target Iran for sanctions for its human rights violations and support for terror. Although Iran insists that its ballistic missile program is purely defensive, in November 2017 Hossein Salami, the lieutenant commander of Iran’s Islamic Revolutionary Guard Corps (IRGC), threatened that if Europeans insisted on negotiating over Iran’s missile program, Iran would increase the range of the missiles to reach Europe. Iran has tested ballistic missiles capable of reaching Israel and reportedly used a Star of David as a target for one of its ballistic missile tests. A UN report last week found that Iran had supplied ballistic missiles to Houthi rebels in Yemen. This would be a violation of Resolution 2231, which also prohibits Iran from transferring weapons—both conventional weapons and ballistic missiles—to other countries. Lt. Gen. Jeffrey L. Harrigian, who oversees the Air Force’s Central Command in Qatar, said an investigation of the Saudi capital-bound missile’s remains uncovered evidence proving “the role of [the] Iranian regime in manufacturing” the missile, according to CBS News. Saudi Arabia’s foreign ministry said it also found similar evidence regarding Iranian manufactured missiles after a July 22 launch from Yemen. CBS News noted French President Emmanuel Macron similarly said the missile was “obviously” Iranian earlier this week. Harrigian made his comments during a news conference in Dubai on Friday following the most recent strike near Riyadh, Saudi Arabia, but declined to mention any specifics on what type of missile they believe it was. Saudi Arabia reported it shot down the missile on Nov. 4 near Riyadh’s international airport, the deepest location to date for a rebel missile to reach. The country has long has accused Iran of providing weapons to the Shiite rebels, known as Houthis, and their allies. In turn, Tehran has long denied supplying the missiles. Michael Knights, a fellow at the Washington Institute For Near East Policy who previously worked in Yemen, said in an analysis Thursday that “it is not a stretch” to believe Iran is supporting Houthi rebels. The bills will now move to the Senate where another vote is expected, before the new legislations are sent to the President’s desk to be signed into law. This process is expected to take approximately one month. INU – US escalation toward the Iranian government and the Lebanese Hizbollah moved forward when on Wednesday, Democratic and Republican members of Congress unanimously voted through measures designed to curb Iran’s ballistic missile program and Hizbollah’s funding. Three resolutions were approved, after nearly six months of deliberations and amendments, that tighten the economic screws on Tehran and the Shiite militant party. Democratic and Republican members of Congress unanimously voted orally in unison, and passed the following resolutions: 1- H.R 359 – Urging the European Union to designate Hizbollah in its entirety as a terrorist organization; 2-H.R. 3342 – Sanctioning Hizbollah’s Illicit Use of Civilians as Defenseless Shields Act; 3-H.R. 3329 – Hizbollah International Financing Prevention Amendments Act of 2017 (HIFPA). On Thursday, Members will vote on Resolution H.R. 1698 – Iran Ballistic Missiles and International Sanctions Enforcement Act. These Ballistic missile sanctions put a stop to any outside support for Iran’s missile program, and are significant in terms of timing and efforts by the Trump administration to push for concessions from Tehran on the issue. In terms of scope and reach of the proposed sanctions, the HIFPA bill represents the largest escalation against Hizbollah. It authorizes new sanctions against the group and its financial networks, and it requires the US president to release an annual estimate of the net worth of Hizbollah leaders and backers, including its secretary general Hassan Nasrallah. Also targeted by the bill are Hizbollah affiliates, including Bayt Al Mal, Jihad Al Bina, the Islamic Resistance Support Association, the Foreign Relations Department of Hizbollah, the External Security Organization of Hizbollah, and its media outlets — Al Manar TV and Al Nour Radio.